Washington State signed 18 recruits on Wednesday, the first day of the early signing period. Here are 10 things we know about this class. Sure, rankings aren’t everything. But WSU’s recruiting classes under Leach have traditionally come in ranked in the 40s or 50s. This class is currently ranked 38th nationally, per 247Sports.com, and boasts two four-star signees (QB Cammon Cooper and WR Rodrick Fisher) for the first time in the Leach era. From Destiny Vaeao in 2012, to Fred Mauigoa in 2016 the Cougars signed at least one player who had Polynesian origins in each of Leach’s first five recruiting classes. LB Fa’avae Fa’avae, from the 2017 recruiting class, is of Polynesian descent, but hails from Santa Ana. But this recruiting class is WSU’s first since Joe Salave’a left for Oregon, and WSU did not make any recruiting trips to Samoa this cycle. The Cougars did, however, sign one player of Polynesian descent, defensive tackle J. Pono Lolohea, who is from Hawaii, but comes to WSU from Copiah-Lincoln (Miss.) Community College. Athlete Patrick Nunn from Junipero Serra (Calif.) High, has also accepted an invitation to play in the Polynesian Bowl in January. Nine signees came from California, with two from Washington and Texas, and one each from Florida, Utah, Michigan, Oregon and Hawaii. Rodrick Fisher, a four-star receiver out of Spokane’s East Valley High, has had to fight to get to where he is. With a complicated parenting situation, at one point, Fisher was homeless, and almost dropped out of high school. Help came in the form of his high school coach, Adam Fisher, who took the receiver into his home and eventually adopted him. Rodrick Fisher will play in the U.S. Army All-American Bowl in January. Fisher says his adopted son’s biggest asset is his speed. Rodrick Fisher ran a 10.46 100m last spring – fastest among high school athletes in the state of Washington. “There’s not many kids in the country, and even in college that are running his speed and able to move like him and catch the ball,” Adam Fisher said. This is filed in the “no, duh” category. Lehi High School quarterback Cammon Cooper is the top-ranked recruit of the 2018 signing class, and per WSU football chief of staff David Emerick, Cooper might be the most highly ranked quarterback recruit Leach has signed since Graham Harrell in 2004. Harrell, who coached receivers at WSU in 2015, was ranked eighth nationally among pro style quarterback recruits coming out of Ennis (Texas) High School that year, and he went on to lead Leach’s Texas Tech squad to a No. 2 national ranking. Cooper is ranked 14th nationally, and his potential is tantalizing. “He’s able to sling it. He’s got a great release, quick release. He goes from the side, and reminds you of Philip Rivers,” said former WSU quarterback Jason Gesser. It’s rare for linemen –both offense and defense –to contribute as true freshmen because it’s often tough for these 18-year-olds to compete with grown men. However, the Cougars are desperately in need of some bodies at defensive tackle. And Crenshaw’s Ahmir Crowder is physically developed and could fulfill that role. If the tape translates to the field, you could see Crowder in the middle of WSU’s defensive line in 2018. 6. The “Most Likely to Contribute Immediately” Award goes to … WR Drue Jackson or WR Rodrick Fisher. It’s a tie. WSU is in need of some outside receivers next year. Lucky for the Cougs, they’ve signed four receivers for 2018, and all four are tall, rangy playmakers who project favorably. Fisher stands out because of his speed and the fact that he’ll enroll in January, which should give him a leg up on his competition. Jackson stands out because he’s played a high level of football in Texas, and has a versatility the Cougs could use. Two signees WR Patrick Nunn (California), and QB Cooper (Utah) come to WSU fresh off state championship wins. Two others – OT Cade Beresford (Washington) and DB Myles Green-Richards (Oregon) – led their programs to the state title game, but finished as runners-up. Valley Christian safety DeAngelo McKenzie picked WSU over an offer from Notre Dame. Beresford and and defensive back Halid Djibril picked WSU over offers from USC –Djibril also turned down UW to sign with the Cougs. With the Cougars having been in the Pac-12 title race till late in the season three years running, WSU is now going toe-to-toe with some big programs and winning those recruiting battles. That marks progress. 9. Did Leach’s dalliance with Tennessee, and the interest other programs have shown in defensive coordinator Alex Grinch unnerve recruits? 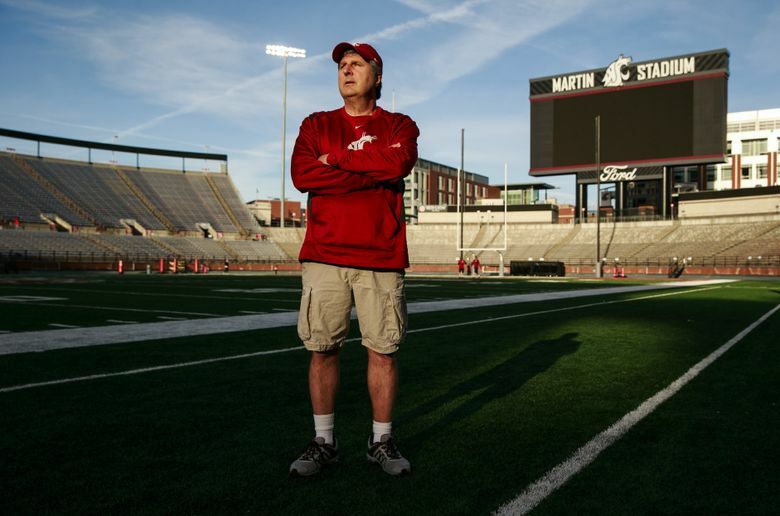 Leach downplayed this on Wednesday, saying he “didn’t find it to be much of a problem.” But, until he signed his contract extension on Monday, Cooper’s father, Cole Cooper, was vocal on Twitter about wanting some assurance of Leach’s long-term future at WSU. Rodrick Fisher’s father and football coach Adam Fisher also admitted to feeling some uncertainty about Leach’s situation until this week. 10. So, after a whirlwind three weeks of nonstop recruiting home visits interspersed with bowl practices, does Leach have any fun anecdotes from the road? Why, of course he does.